The Spinning-Wing Decoy (SWD) is defined as any electric, mechanical, manual, or wind driven rotating-blade device that simulates wing movement. They are used to attract both ducks and geese and work for both short and long distances. Since their introduction in the late 1990s, duck hunters who use them have enjoyed better hunting and bigger bags. 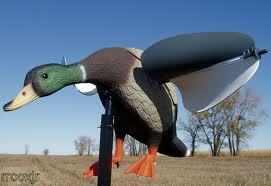 I have used spinning wing decoys (SWDs) soon after they were first introduced in the late 1990’s. I generally use several types of spinning wings in combination with floating, full body, and motion decoys. They definitely enhance my spread giving it more movement and a realistic look. Depending on the weather, wind, and location, I will position them within gun range throughout my decoy spread. Using spinning wing decoys, in any state that allows them, can help you reach your daily bag limit. You should check the regulations in the state you intend to use spinning wings decoys.